A local video game store, which has expanded its offerings since moving into a larger space over the summer, is once again growing—and not just a little bit. Jeffrey Meehan/Pahrump Valley Times Josh Osborne, co-owner of the Game Corner at a strip mall at 1190 E. Highway 372, Ste. 17-18, is planning a big increase in his footprint and services he currently offers to area residents in Pahrump. He is moving to another suite within the same strip mall, though to a space five times the current one he holds. 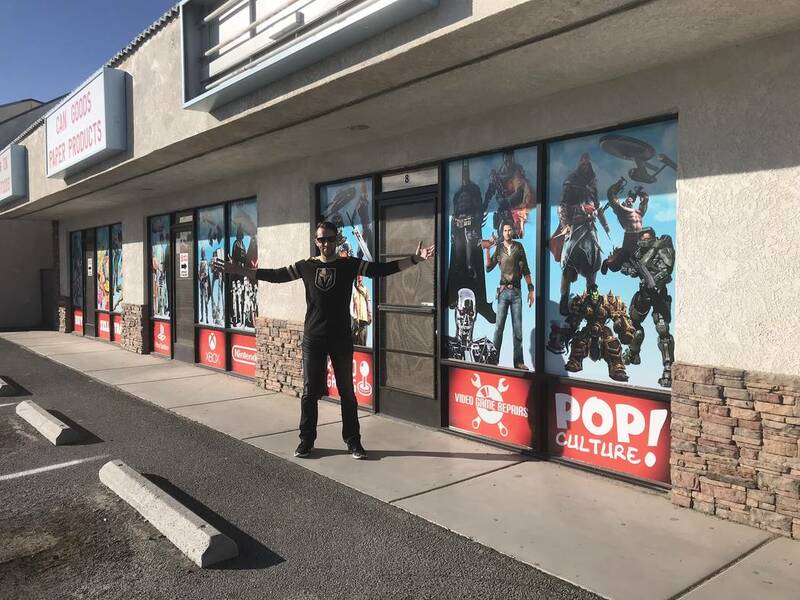 Jeffrey Meehan/Pahrump Valley Times People streamed into Game Corner over the summer of 2018 when the store held a grand opening for its new 1,000 square foot space at 1190 E. Highway 372, Ste. 17-18. The store, now moving to a 5,000-square-foot unit at the same center, was once housed inside the computer repair and retail shop Great Computer Deals. 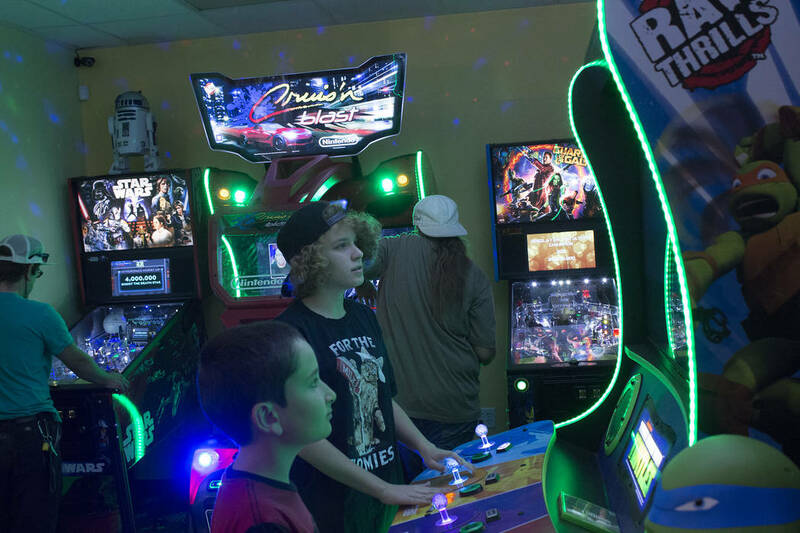 Jeffrey Meehan/Pahrump Valley Times Local children and others play a variety of arcade-style video games at Game Corner on June 23, 2018 at 1190 E. Highway 372, Suite 17. Game Corner expanded to the new space in February 2018 and celebrated its official opening at the end of June will be moving to a new 5,000-square-foot space within its current center, which will also bring with it more entertainment and fun for locals and visitors. Game Corner, which rose from being set in a part of a sales and repair shop for computers and related equipment, Great Computer Deals, at 1190 E. Highway 372, Ste. 16, to pushing into a 1,000-square-foot space in a neighboring unit, is picking up even more square footage. Josh Osborne, who co-owns Game Corner and Great Computer Deals with his father, said he is expanding the Game Corner by five times its current size. 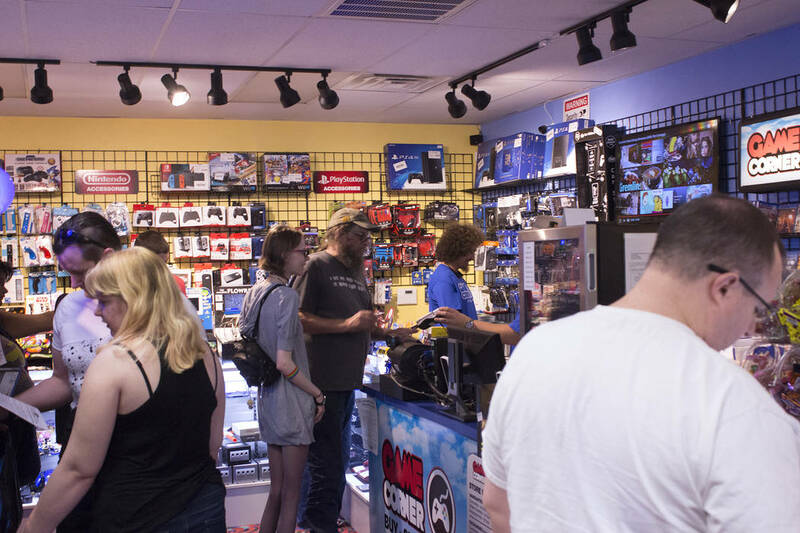 With the expansion earlier this year, Game Corner started offering arcade game play and tournaments, along with a variety of accessories and other products. Osborne is working on setting up his current enterprise expansion over the next several months and planned for a soft opening first, so he can get all the bugs worked out before having a lot of people come through, he said. That soft opening of the expanded space occurred on Tuesday and some games were available for play. Osborne said he is planning to vacate the 1,000-square-foot space for the larger unit. With the new, larger unit, Osborne said he could eventually need to expand on his number of employees. But for now, he is set with his current crew. Osborne said he’s expanding the demographics that he targeted in his smaller space at the new space, just a few doors down from his current shops. The space he’s taking over once housed the Grocery Surplus store, which was in Pahrump for some two decades and closed earlier in 2018. That shop was located in suite 8 at the retail strip center at 1190 E. Highway 372. Options for all ages will be available inside the expanded space, even for seniors, Osborne said. One example he used was his plan to bring in pinball machines from across the ages, including from the 1960s to today. Osborne said he’s also planning on expanding the number of video game tournaments in the new space. He explained that things have been going well with his 1,000-square-foot space where he sold video games and other related items, along with having an area for arcade games, but space has been an issue. Osborne said he realized he needed more space after they held their first tournament that brought out a couple dozen competitors. But those competitors also bring many other people with them – friends, family and others that really packed the space. “People were out the door, and we realized, OK, we’re onto something here, this is going to be pretty cool, but there’s no way we can expand on this unless we have the physical space to do it, and the timing was perfect because the Grocery Surplus place closed earlier this year,” he said. The new space could also have expanded hours, including being open seven days a week and in the evenings, where the smaller space was closed on Sundays. The tournaments will also be enhanced as part of the move with Osborne looking at implementing the concept of e-sports into his business plan. At his smaller suite, he would have competitions that involved kind of a “bracket system” where players would compete in a one-on-one format and prizes would be given out to the top three winners. “We’re building a stage over at the new location, so we’re going to have lights, we’re going to have a really cool professional gaming area,” he said. E-sports is very popular right now, Osborne said. Osborne said every time he’s experimented with bringing new things to Pahrump, it’s been responded to well. Globally, e-sports is expected to grow. According to a December 2017 report by commercial brokerage CBRE’s Los Angeles office, the global e-sports industry was expected to hit just under $700 million in media rights, advertising, sponsorship, merchandise, ticket sales and publishers’ fees for 2017, citing estimates from Newzoo, a market research and data firm for the games, e-sports and mobile marketplace. That number was expected to increase to some $1.5 billion annually by 2020 with an expected 35 percent annual growth rate.